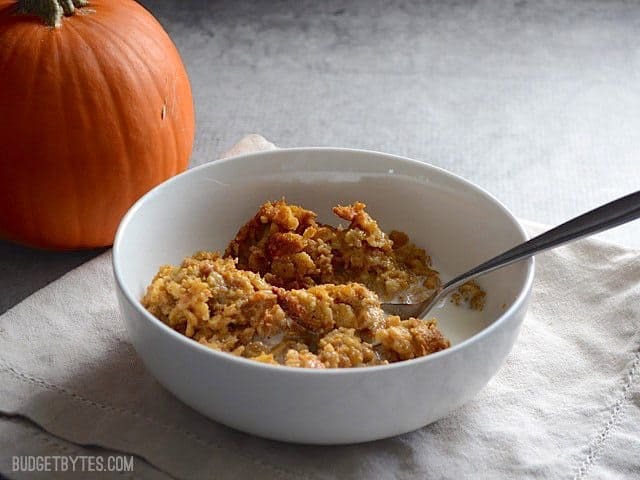 Baked oatmeal is basically like oats baked into a custard-like mixture. They’re soft (not crunchy like the photos sometimes appear), warm, and very moist. 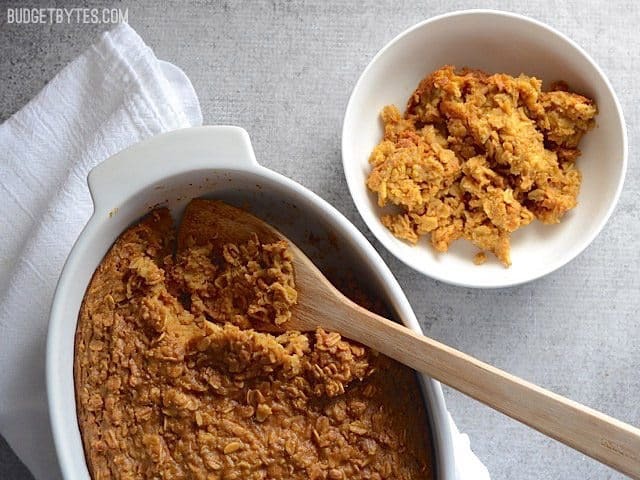 Baked oats are more firm than traditionally cooked oats because they contain eggs and less liquid, but still remain soft. Almost like bread pudding! 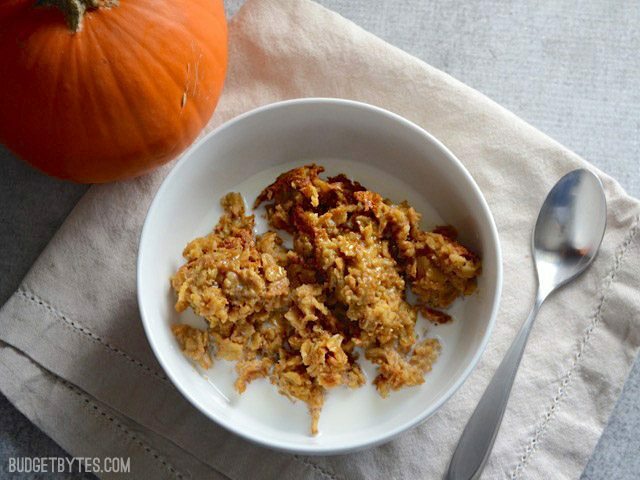 Want more baked oatmeal recipes? 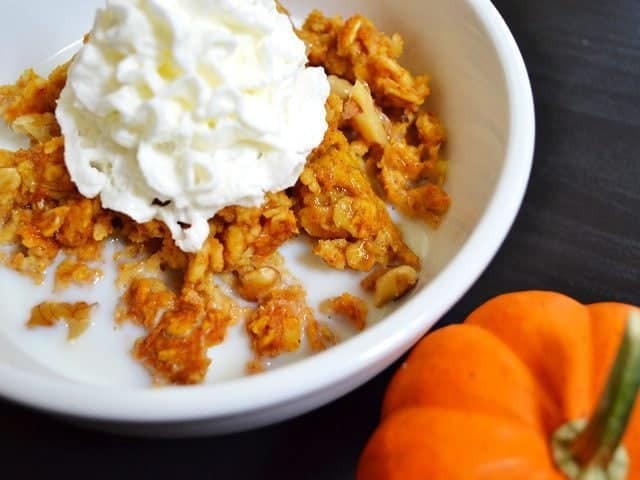 Check out Sweet Potato Casserole Baked Oatmeal and Oatmeal Cookie Baked Oatmeal. I absolutely loved eating this cold every morning (you can also reheat, if preferred). I drizzled some maple syrup on top and then added some milk. 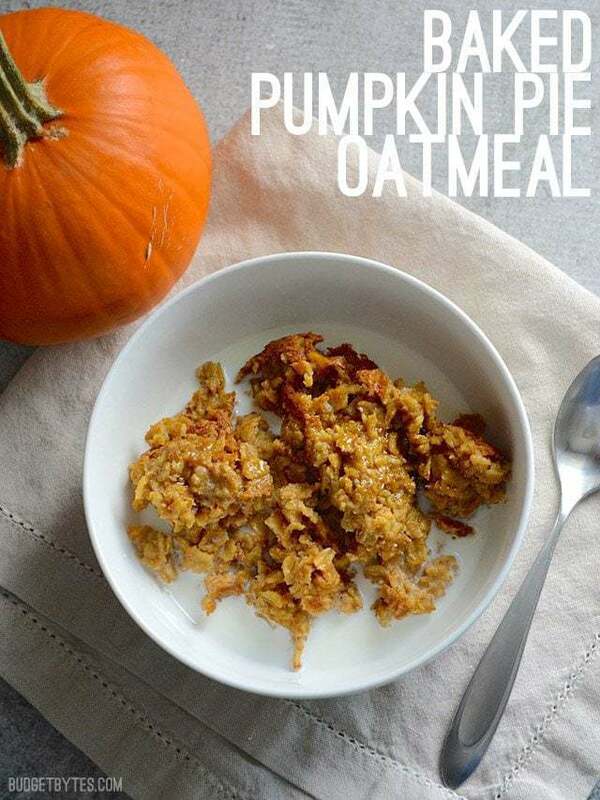 It was the best oatmeal I’ve had in a while… and since the oats are pretty much baked in a pumpkin pie filling mixture (minus a lot of the fat), it truly does taste like pumpkin pie. You can also try topping it with nuts, whipped cream, or raisins. This is a bake once, eat all week type of meal. 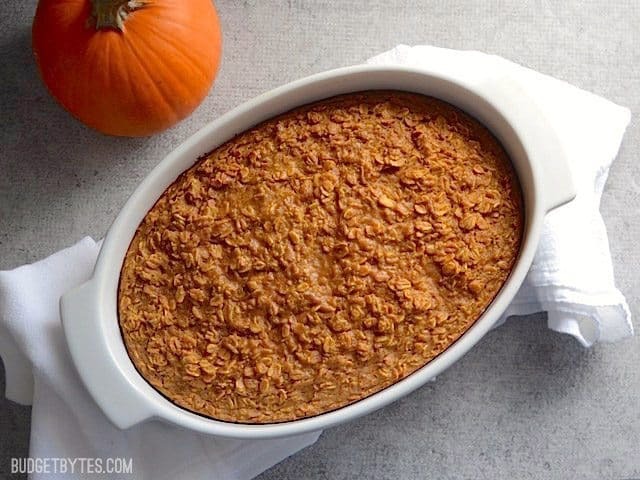 After baking I divide the pumpkin pie baked oatmeal into single portions, then store them in the refrigerator for 4-5 days or freeze them for up to a few months. 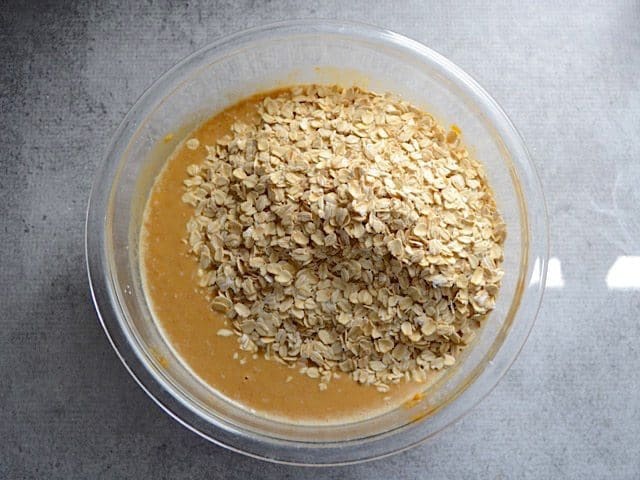 If you plan to freeze some of your baked oatmeal, chill it completely in the refrigerator first, then transfer to the freezer. First, preheat your oven to 375 degrees. 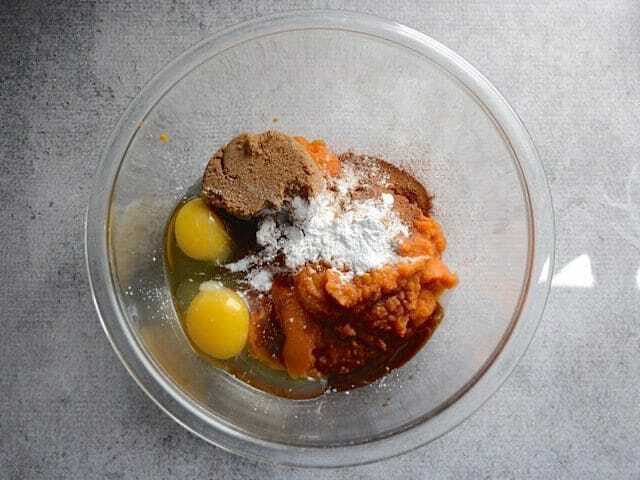 Then, in a large bowl, whisk together one 15oz. 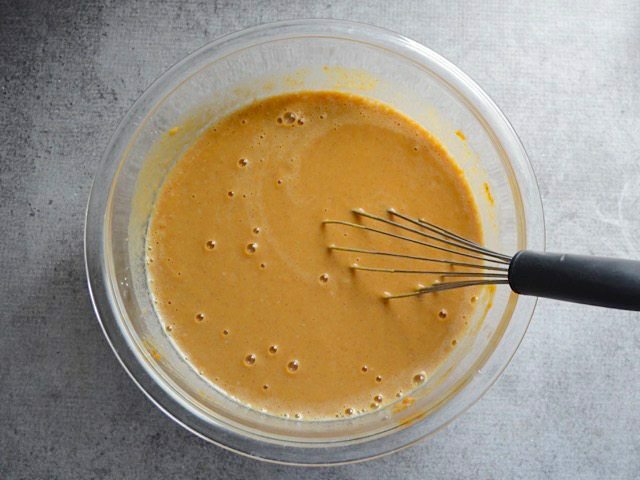 can pumpkin purée, 1/2 cup brown sugar, 1/2 tsp vanilla, 2 large eggs, 1/2 tsp salt, and 3/4 tsp baking powder. 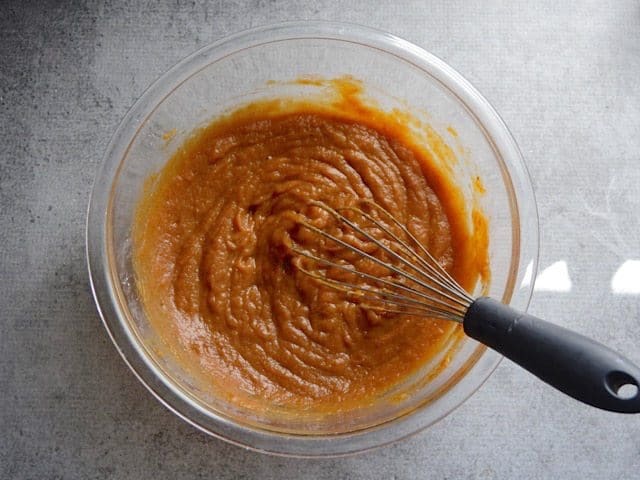 Whisk those ingredients together until smooth. Add 2.5 cups rolled oats. I find that “old-fashioned” rolled oats work the best because they have more texture than quick or instant oats. 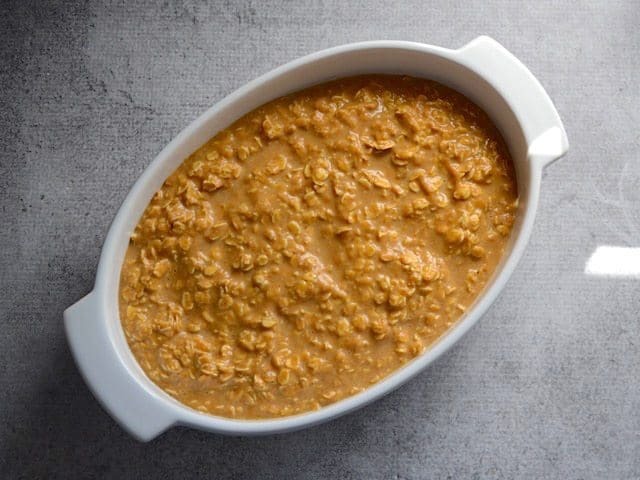 Stir the oats into the pumpkin custard. Coat a baking dish with non-stick spray. 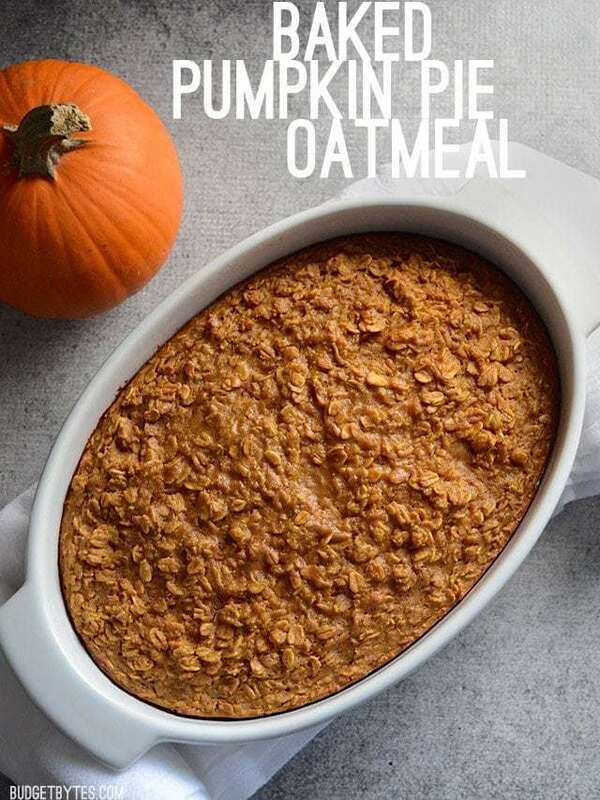 Pour in the pumpkin oat mixture and bake for 45 minutes, or until the center is no longer wet and the edges are slightly golden brown. And then you have a delicious, gorgeous, vibrant orange, baked oatmeal packed full of nutrients. I refrigerated the whole dish of oatmeal and just scooped some out every morning. It makes breakfast *so much* faster. I adore walnuts so I added some to my first bowl. Surprisingly, the oatmeal itself was so good that the walnuts were just lost in the awesomeness… so I didn’t even bother with them for the rest of the week! This is still my favorite breakfast food. I’ve been making it for years. Thank you. Does this freeze well? 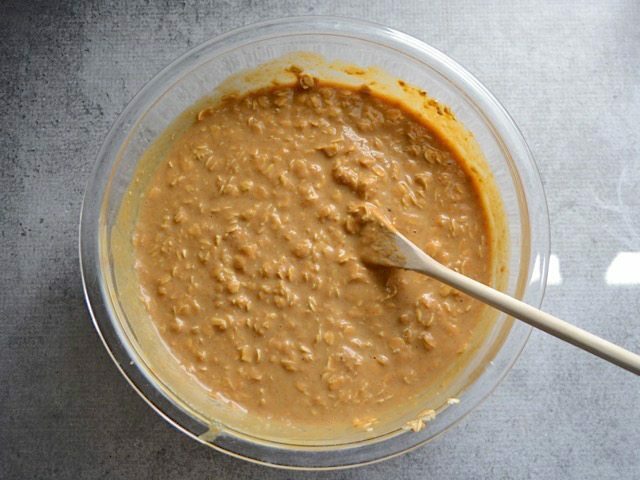 I’m looking for oatmeals I can freeze for when baby comes. Thanks for the input! So delicious! I’m new to the site and love it! Thank you! This is the second time I’ve made this. It is awesome, cheap, and easy (like me!!). I don’t know why I don’t make it more often. I know this post is 5 years old..but I still come back to your blog/recipes. I had tried baked oatmeal many times, and none was very good. This one, however, is AWESOME! Thank you so much! My fall favorite! I discovered your site last year and have made this many times. As soon as I woke up to the crisp morning the other day, I instantly thought of your recipe. Thanks so much Beth for all the recipes you post. Everything I’ve made from your site has been a big hit! Even though I didn’t follow all the instructions perfectly (I accidentally set the oven to 350 and only used 1/3c brown sugar, also by accident) this is by FAR my favorite baked oatmeal recipe! I might increase the oats a smidge next time to 2 3/4 or 3c, and will probably keep the temp and sugar quantities the same. 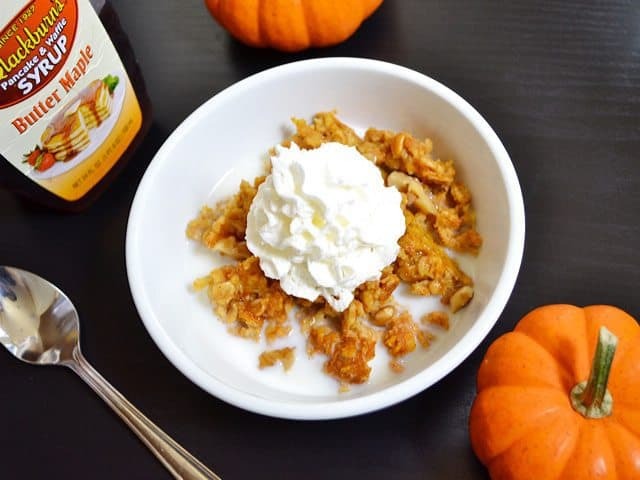 This was perfect for our Halloween breakfast! Wish I could post a picture here. We dressed it up with organic gummy worms, whipped cream on the side with little black plastic spiders. I just made this for the first time last night – but it won’t be the last! Considering trying an apple variation, using unsweetened applesauce in place of the pumpkin, decreasing the milk a tad, and adding apple pie spice and chopped apples! Thanks for the recipe! I’ve made different flavors with apple sauce and mashed bananas in place of the pumpkin. Just about any mashed fruit works well! :) Yogurt works, too. What about adding some apple butter? Awesome concentrated apple and spice flavor! Yum, this turned out excellent! 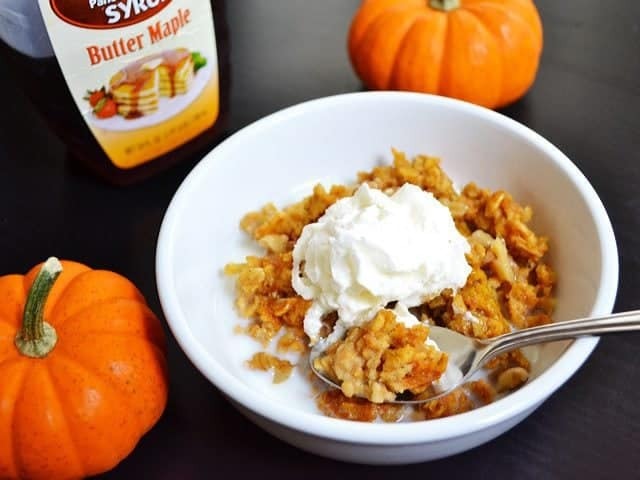 Instead of brown sugar I used a few spoonfuls of sweetened condensed milk, and topped each serving with another drizzle. Next time I will try substituting fresh cooked pumpkin/winter squash and maybe add some chopped apples. Do you have the nutritional information for this? Made this for breakfast last weekend with a few minor changes (decreased the brown sugar to 1/4 cup and used my own mix of cinnamon, nutmeg, allspice, ginger, and cloves. It was delicious and still sweet enough for me and my boyfriend. I served it with sliced banana and almond butte r- yum!